Okay, this could turn any Scrooge into a Believer! 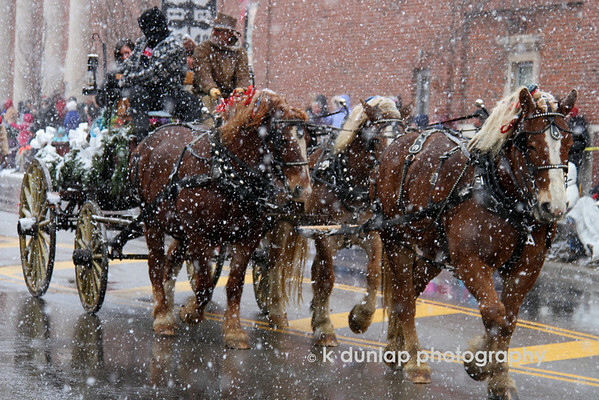 What could be more festive than the Carriage Parade down Main Street in Lebanon, Ohio? I just love all the Christmas traditions and the Carriage Parade is one of them. Hot chocolate with homemade peppermint marshmallows while watching a team of horses come down Main Street. Gotta’ love it! Love this shot! What a lucky shot! Great work! The snowflakes add an element of magic to this shot. This is an outstanding shot. It would have been a good shot even without the snow, but the snow turns it into a truly unique shot. I'd put this one on my Christmas card! What a fantastic winter wonderland! This is fabulous. The snow adds so much. Great shot. WOW, WOW, WOW - this is magical!!!!!!!! Love it !!!!!!!!!! Wonderful holiday scene, could be right out of "Its a Wonderful Life"!